For many students, winter break means a welcome vacation from books and reading, but for others, it is a long-awaited opportunity to crack open that new, juicy novel. If you belong in the latter category, and if you are looking for a new book to sink your teeth into, this post is for you! 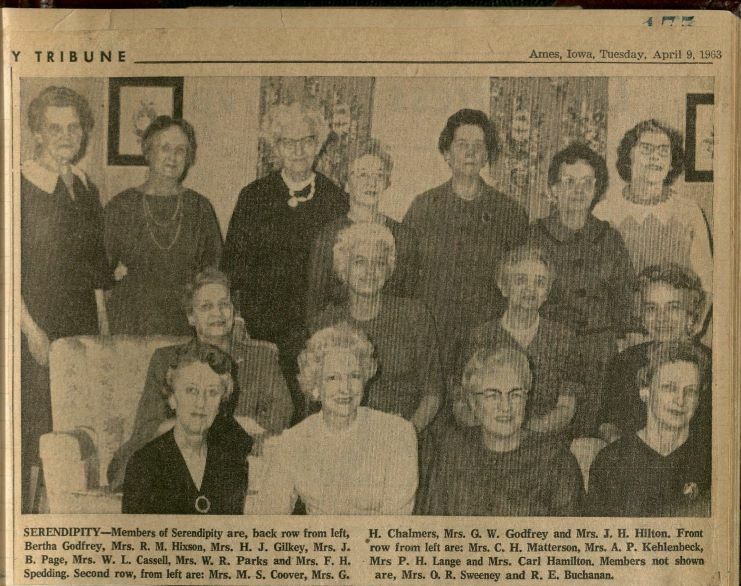 Today we are taking a look at the Serendipity Club, an organization that was founded in Ames in 1936 by a group of women to promote reading and friendship. The fifteen founding members were the wives of Iowa State College professors and administrators. Among them was Mrs. Vera Friley, wife of the Charles E. Friley, president of the college from 1936-1953. Serendipity Club members in 1963. Ames Tribune, April 9, 1963. “These princes in their wanderings were always discovering, either by chance or sagacity, desirable things which they did not seek. “Hence, the word has come to mean the art of acquiring something that is both pleasurable and profitable without any seeming conscious effort” (Box 1, Folder 1. Journal of Activities (Minutes), p. 6. April 30, 1936. The Serendipity Club Records, MS 358, Special Collections Department, Iowa State University Library). The ladies unanimously voted to adopt the name. They decided that, in order to vary the reading, each member would choose her own book to purchase through the club each year and that the books would be passed around amongst the members. At each monthly meeting, there would be no discussion of the books read; instead, the ladies would present information on the author of their chosen book. Although the ladies did not review their books, there was no lack of lively discussion. At different times, letters would be read aloud that members had sent back from various exotic vacation spots, like California and Italy, or members would show off their souvenirs, such as the time Mrs. Buchanan brought “a most interesting display of textiles who [sic] had been woven in Egypt and it gave us a very definite idea of the garb worn by the shepherds” (Box 1, Folder 2. Journal of Activities (Minutes), p. 35. November 22, 1949. The Serendipity Club Records, MS 358, Special Collections Department, Iowa State University Library). “Mrs. Buchanan entertained the group with an account of her visit to Father Divine, and his heavens in West Harlem N.Y.–how his obscure theological reasoning confounds his followers; how he manages the financial side of his enterprise and how the advent of one of Father Divine’s “heavens” in Harlem means a moral cleanup of the entire block. “The description of his Peace Mission[,] a stone house of fifty rooms, his huge Duesenberg sedan, 22 ft in length[,] his numerous important angels, his habit of midnight banqueting and his Pinninah, the only one of his women followers who is permitted to sit beside him, was of interest to all of us” (Box 1, Folder 1. Journal of Activities (Minutes), p. 60. November 26, 1939. The Serendipity Club Records, MS 358, Special Collections Department, Iowa State University Library). The meetings always included refreshments and a social hour. Chairman Dorothy Elwood summed up one meeting: “We had a lovely noisy meeting–the kind Serendipity thoroughly enjoys” (Box 1, Folder 2. Journal of Activities (Minutes), p. 12. September 24, 1947. The Serendipity Club Records, MS 358, Special Collections Department, Iowa State University Library). 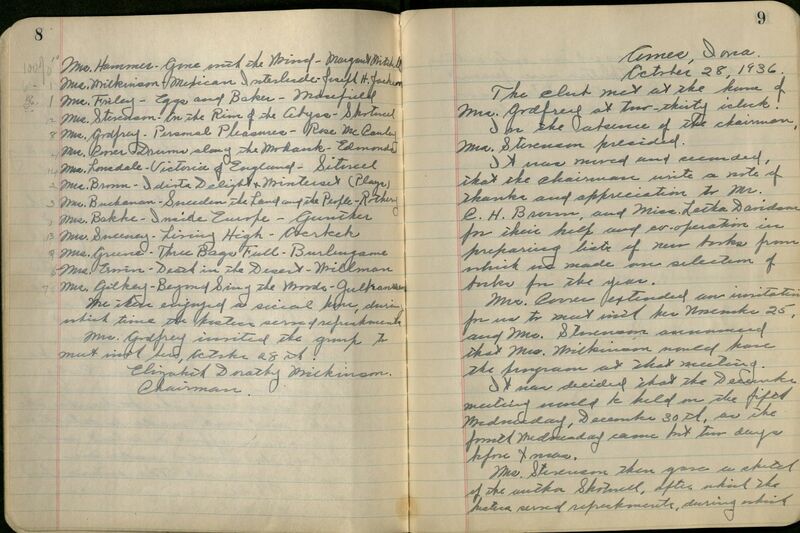 Pages from Journal of Activities, showing Gone with the Wind at the top of the list (left). The Serendipity Club Records, MS 358, Special Collections Department, Iowa State University Library. Now doesn’t that just make you want to curl up in front of the fire with a good book? To learn more about the Serendipity Club, check out the finding aid for MS 358, The Serendipity Club Records, or come look at it in Special Collections.